Heirloom seeds are generations-old, non-hybrid varieties, many of which originated in Europe. Handed down from gardener to gardener, they are some of the most unique types available. 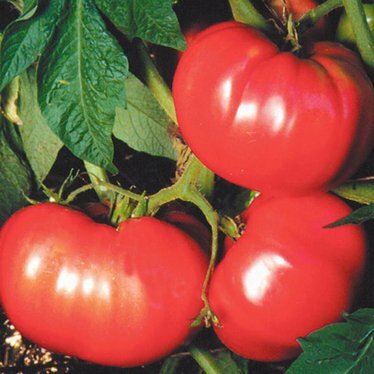 Strong 'potato leaf' type plants produce large 1-2 pound beefsteak fruits. Full sweet flavor. Discover the wild, wonderful world of heirloom plants. Generations-old, non-hybrid varieties handed down from gardener to gardener, they are some of the most precious and unique types available. Many originated in Europe centuries ago and were brought by immigrants to the USA. Seed Saver's Exchange is a non-profit, member-supported organization that saves and shares North America's diverse but endangered heirloom seeds, forming a living legacy that can be passed down through generations. Preserve our gardening heritage - and grow some absolutely delicious food for your family! USA produced. This is our 2nd purchase of products from Lehman's. The shipping and packaging is always fast and secure. Plus, we've been watching homesteader "Justin Rhodes" and noticed he and his family visited your store in Kidron. Great stuff! German Pink was a big surprise to me, they were very tasty and grew abundantly. They were large on average.